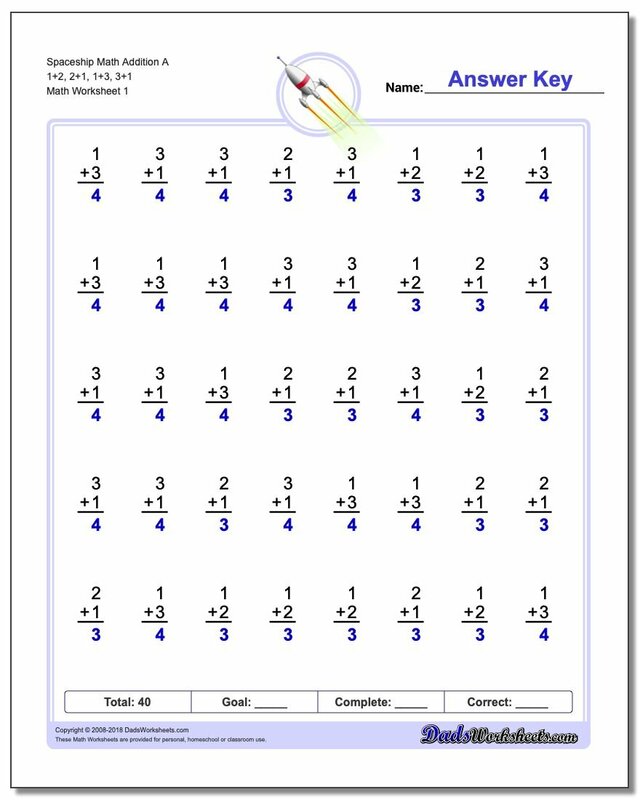 The addition worksheets on this page introduce addition math facts, multiple digit addition without regrouping, addition with regrouping (we used to call this 'carrying' in my day), addition with decimals and other concepts designed to foster a mastery of all things addition. 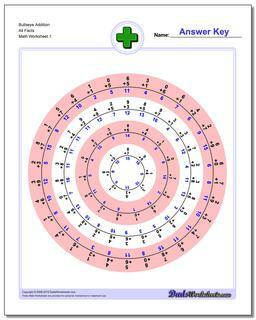 All of the worksheets include answer keys, and there are four versions of each worksheet with different problems. 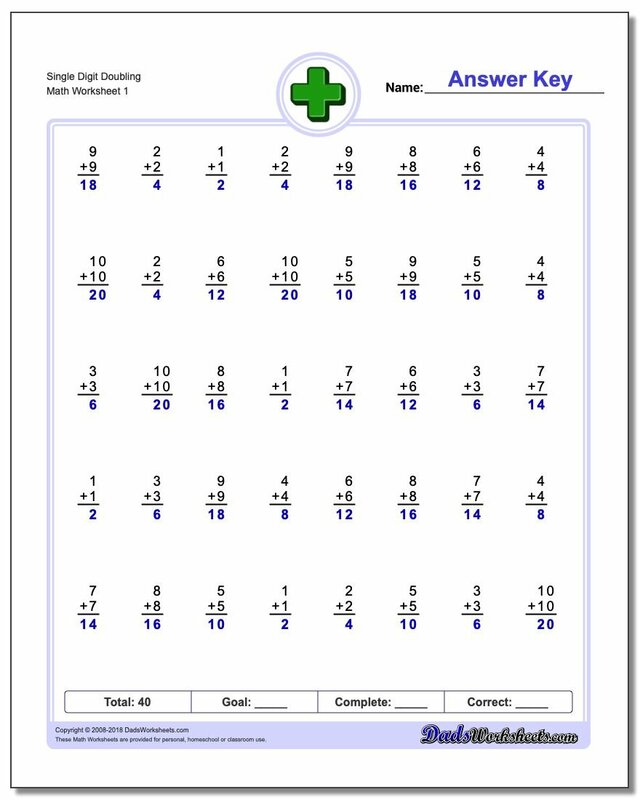 These addition worksheets are similar to the RocketMath, Wolf Swamp or Mastering Math Facts addition worksheets used at many schools. These are typically one minute, timed tests. Try my super entertaining online timer if you or your kids are into silly sounds! 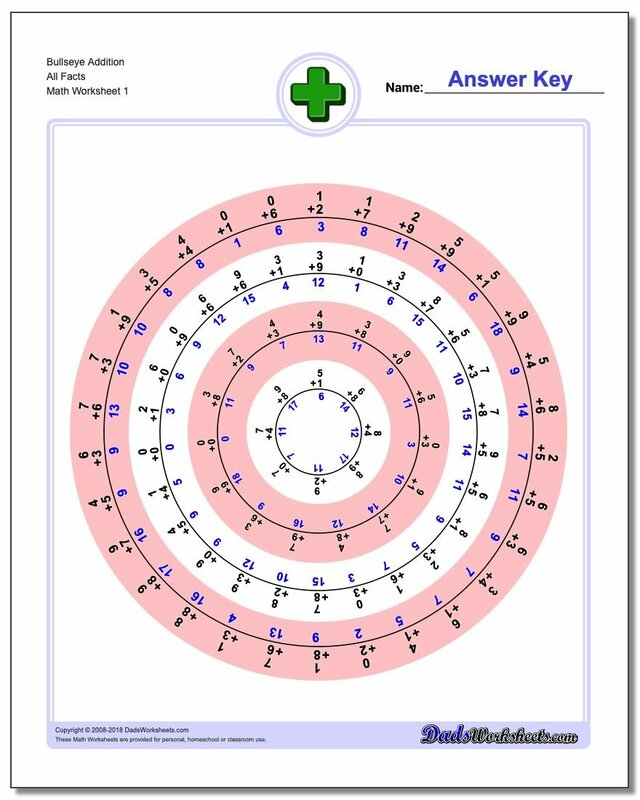 These 80 and 100 problem addition worksheets are designed to incrementally build addition fact competency. 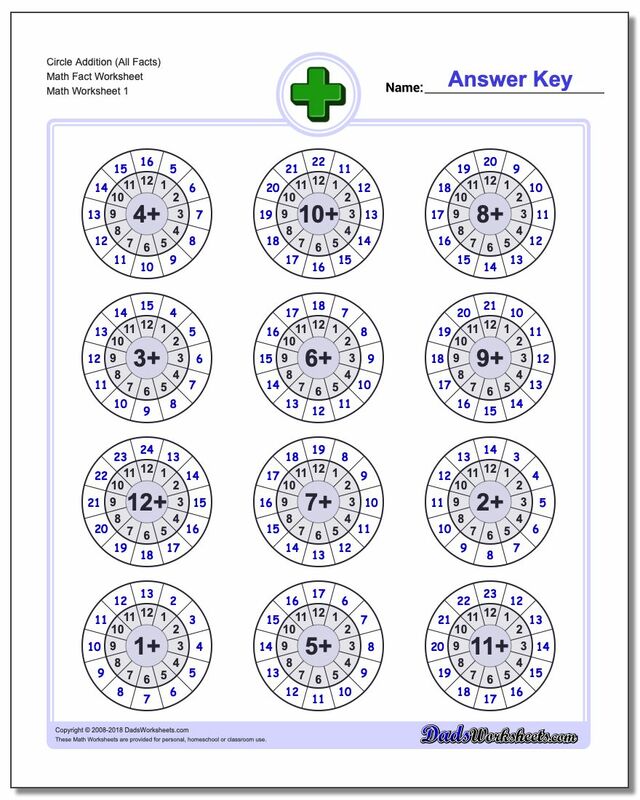 Use these as two minute timed addition tests, which are great at-home practice even if your school is only doing one minute tests. 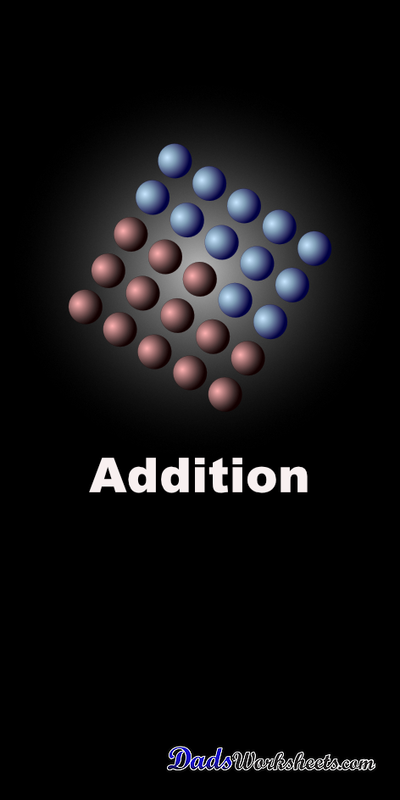 These addition worksheets emphasize groups of related facts and there are variations with the facts in order to facilitate skip counting, or with random products that help facilitate fact memorization. Try the variations with all facts, or print the worksheets that focus only on specific families of multiplication facts that need more practice! 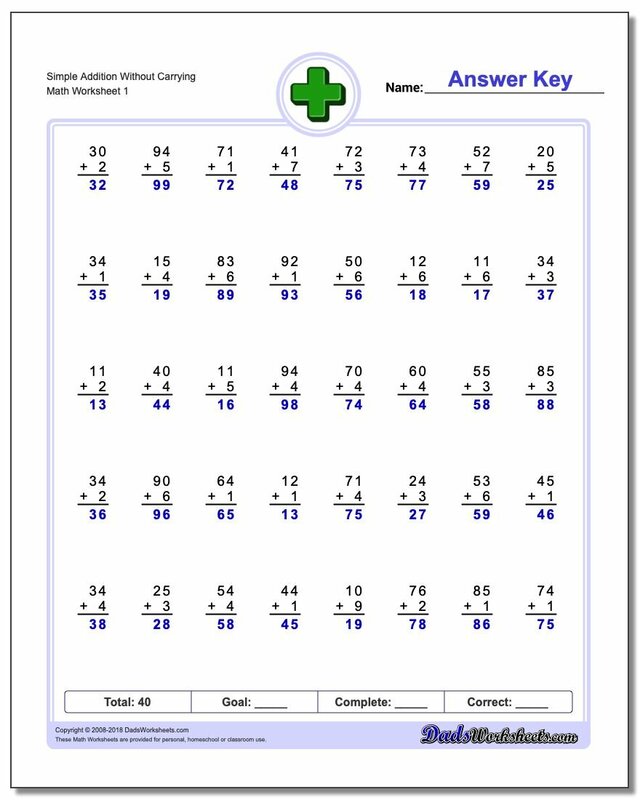 Tired of the same old math fact worksheets with rows and rows of problems? Time to try something unique. 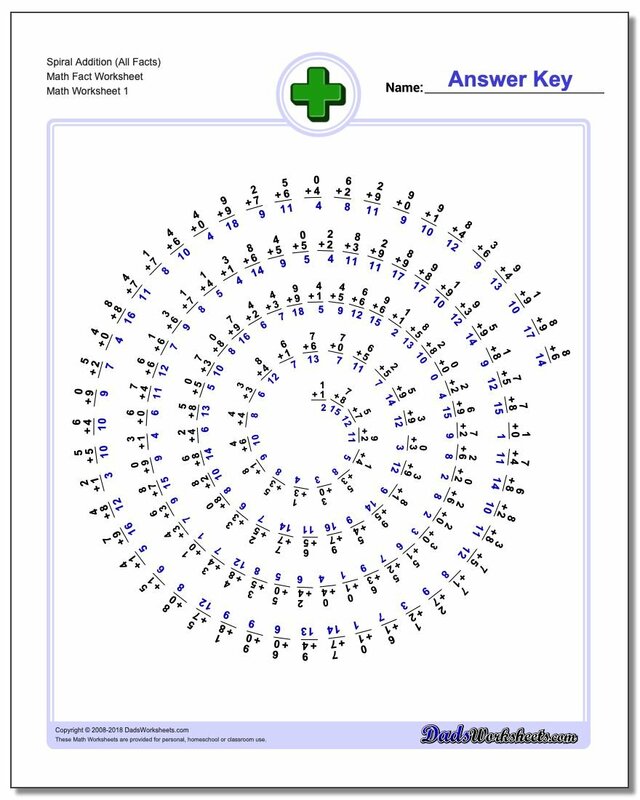 These worksheets present the addition facts in a spiral layout that provides fun a twist on memorization. 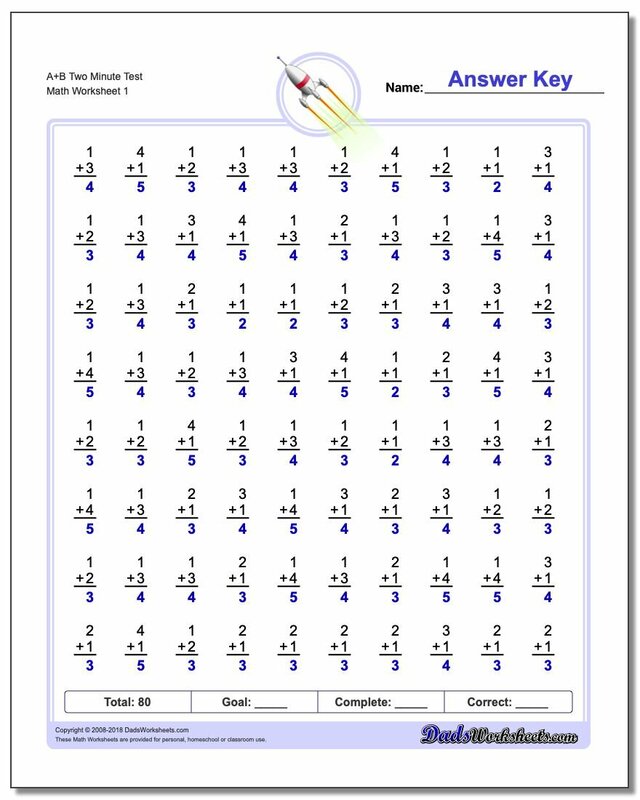 They use the same fact layouts as the spaceship math addition worksheets above, so try the first two sets worksheets if you are looking for the full set of addition facts or practice without the easier problems, or look at the others for an incremental approach to learning the facts. Get on target with those addition math facts! These fun worksheets provide some additional kinesthetics over and above your usual math fact practice. 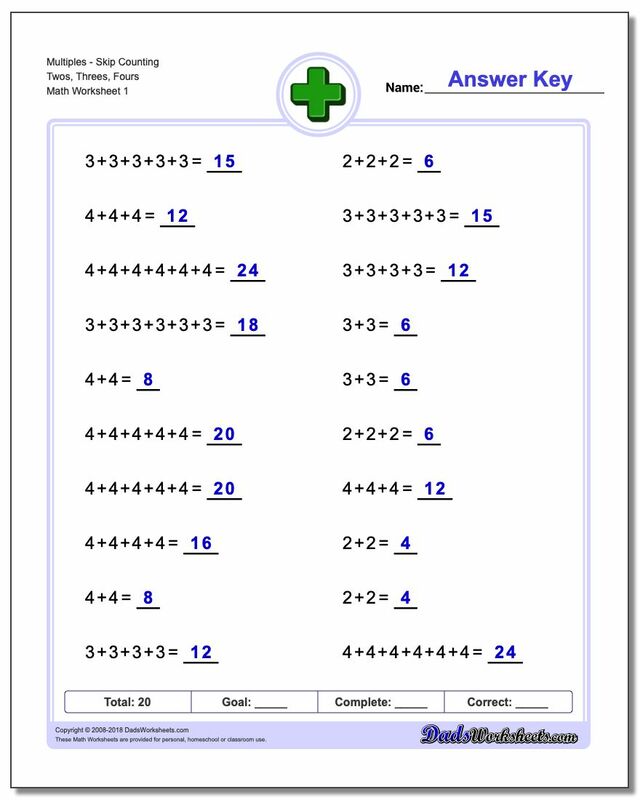 Hopefully you will find these addition worksheets are spot-on when you need a change of pace! 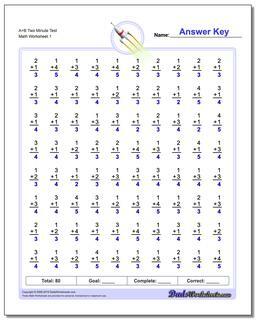 These place value addition worksheets are good first steps towards multi-digit addition problems. These problems require students to add multi-digit values without combining anything in each place value column. These addition worksheets contain multi-digit addition problems without regrouping. Getting comfortable with these will prepare students for full multi-digit addition where regrouping (carrying) is required to find the sum. 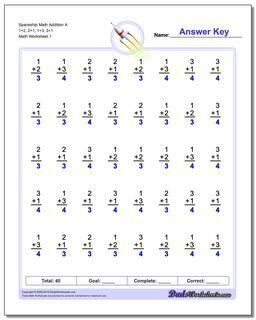 Each of these addition worksheets provide exercises for progressively more complex types of addition problems. 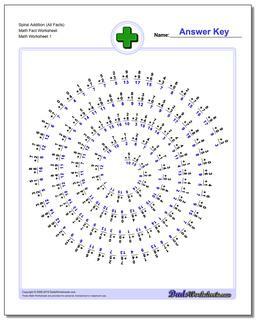 One digit (tenths) and two digit (hundredths) addition worksheets. 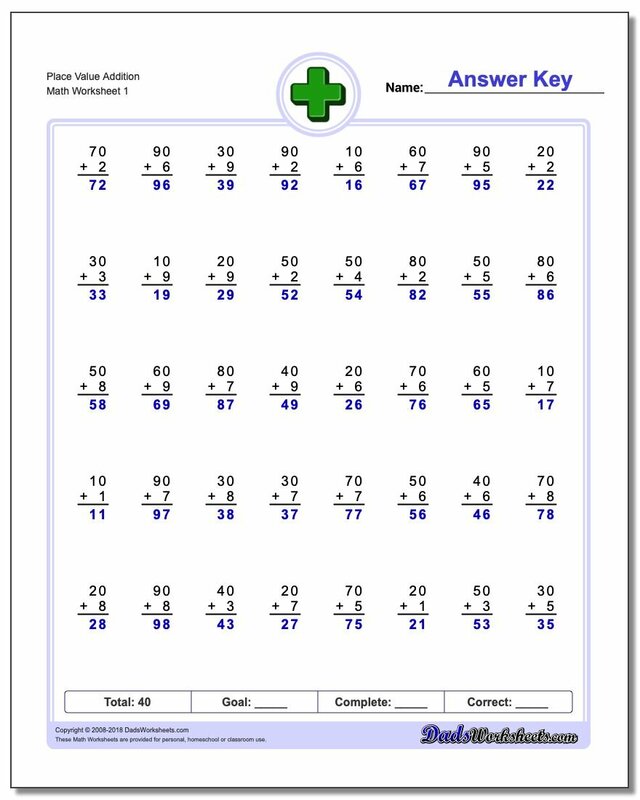 Practice addition worksheets for doubling values. 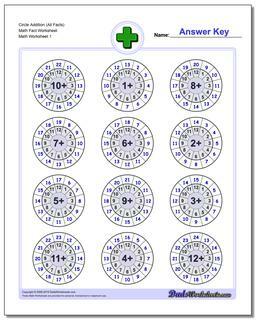 Includes worksheets for single digit addition, two digit addition that require no borrowing (mental addition) and for addition worksheets for factor of five. 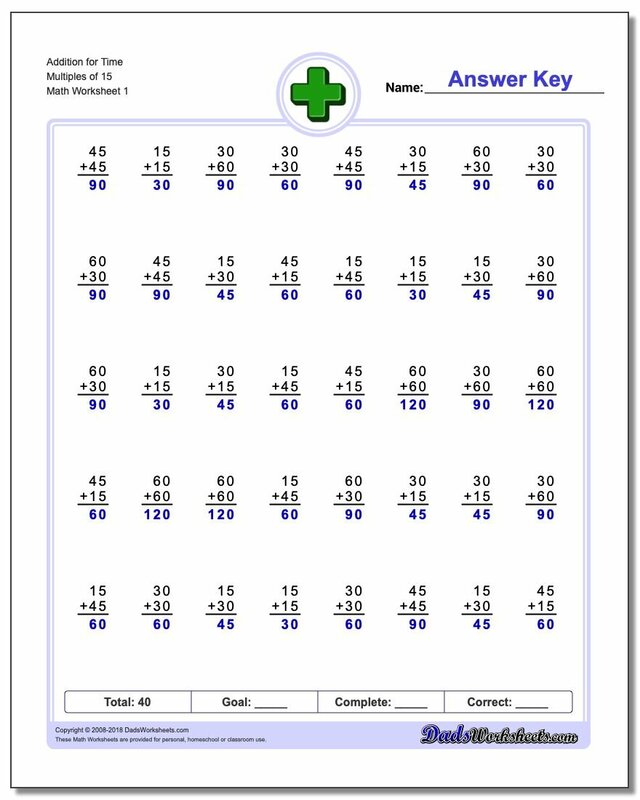 These addition worksheets are great tools for place-value concepts. 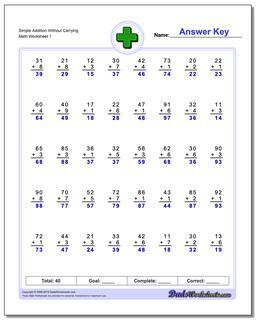 Addition Worksheets for Math Practice!